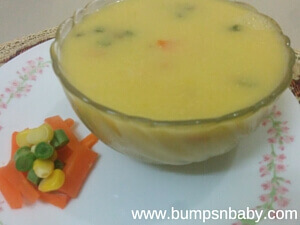 Today I bring to you the healthy sweet corn soup recipe for babies and kids. My version is made from fresh corn kernels and not using the corn starch as in restaurants. Looking to add vegetables to your fussy kid’s diet? Have you been trying soup recipes at home? 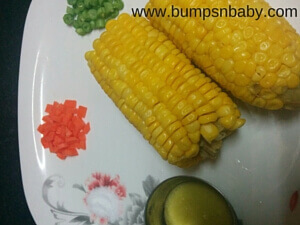 Most of us like corn and sweet corn soup is the obvious choice whenever one visits a restaurant with kids. Nothing can beat the warmth and coziness a warm bowl of homemade soup offers. As most of the kids dislike veggies, soups are an easy way to add them into their everyday routine. So you get the health benefits of veggies and because of their semi-liquid consistency, soups help to cure constipation too. Warm soups help to relieve and soothe common cough and cold problems as well. Sweet corn is a special maize variety and are also known as sugar corn. It is a starchy vegetable but is a functional food too. Do note that the sweet corn is slightly high on glycemic index and simple sugars (in line with rice, potato etc) so it is best to eat the same in limited quantities. This rule applies to most of the things that we eat; isn’t it! 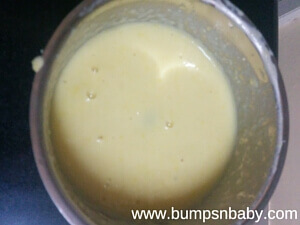 This fresh corn soup recipe can be served to babies above 11 months of age and is especially good after the evening strolls / playtime. If you team it up with some vegetable paratha/dosa/bread/sandwich, the combo can serve as main course as well for small kids. For the recipe, we need to pressure cook the corn with a pinch of salt and then use the cooked kernels to make the base. Blend ½ cup of fresh corn kernels using ½ cup of water. Make a smooth puree and strain it. Keep aside a tablespoon of corn kernels to use later. Heat ghee or butter in a heavy bottom pan and add in the chopped veggies (carrot and beans used here) and cook them for approximately 1 to 2 minutes on a medium high heat. Now add in the corn puree, salt and approximately 1 cup of water. Allow the soup to boil for a few minutes. Adjust the consistency of the soup based by adding water. Add in the remaining corn kernels and simmer for a minute more. Healthy and fresh corn soup is ready to serve. Pressure cook the sweet corn for 3 whistles with a pinch of salt and let it cool. Once the corncobs are cooled, remove the corn kernels from the cob. Hold the corn vertically and with a knife scrape the corn kernels from the cobs. 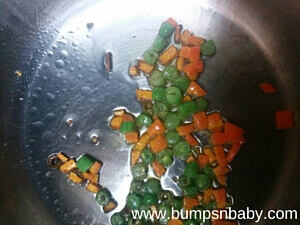 Chop the other veggies like carrot, beans , broccoli , spring onions finely. Heat ghee /butter in a heavy bottom pan and add in the veggies (carrot and beans used here) and cook them for approximately 1 to 2 minutes on a medium high heat. Add in the corn puree, salt and approximately 1 cup of water. Allow the soup to boil for a few minutes .You can adjust the consistency of soup based on your preference by adding water. Add in the remaining corn kernels, allow the soup to simmer for a minute more and serve. You can also add milk instead of water. You can also use herbs to enhance the flavor of the soup. For a restaurant kind of soup add corn flour. 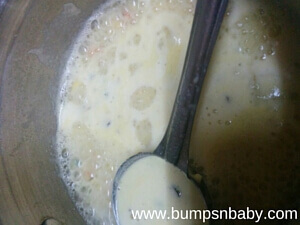 This will add to creamy texture and give different flavor to the soup. To do so, make a paste of corn flour with little water and add in step #6. Black pepper, chilli vinegar and soya sauce can also be added depending on your toddler’s taste. Let your kiddos sip on the sweet corn soup and enjoy the real veggies. If you are looking for soup recipes, you can refer to the 7 healthy and quick soup recipes for babies and kids. Which is your child’s favorite soup? Have you tried this fresh sweet corn soup? 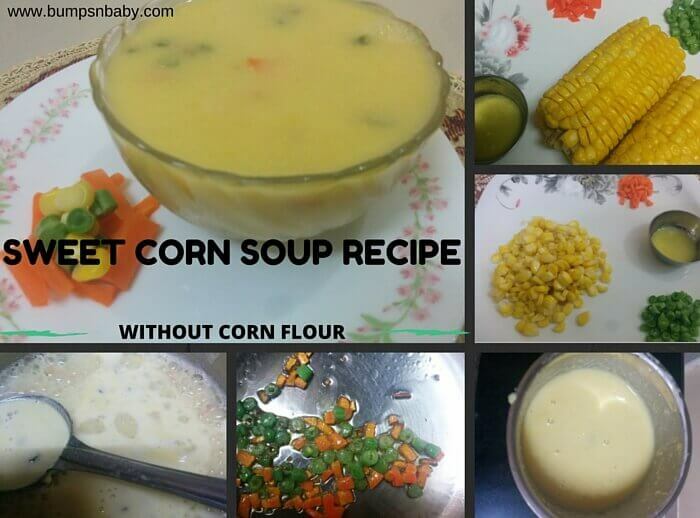 Do make this sweet corn soup recipe at home and let me know in comments the response of your child. Sounds llike a really good recipe though my girls aren’t fans of the traditional corn soup .. I think I’ll try this with them ..can it be made with canned corn if fresh isn’t available? Am sure you will do justice to recipe. Hope kids like it too. Looks awesome ,I will definitely try this one.. Thanks for your feedback. Do try the recipe and let me know how you like it.